Chef Mark McCrowe has teamed up with fellow chef and photographer Sasha Okshevsky to present Island Kitchen: An Ode to Newfoundland. This unique cookbook will document Newfoundland's up and coming culinary style, and various products and suppliers. Traditional indigenous ingredients and local artisan products are showcased in unique recipes that bring a new light to Newfoundland cuisine and help carry on the tradition and culture to a new era. 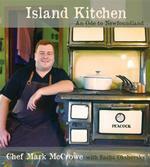 Island Kitchen is a celebration of the amazing food, tradition and people that make Newfoundland such a special place.